Director Hugo Berkeley writes from the field. 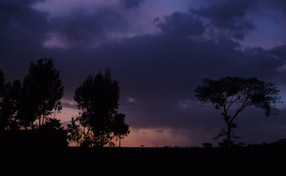 At 3:30 a.m. this morning, we were shivering on the side of a desolate road near Buré, a provincial town seven hours north of Addis Ababa, Ethiopia, in the country’s fertile Amhara heartland. We had come to film Mekonen Motbaynor, a small-scale grain and fruit farmer who, it turned out, was a very early riser. We found Mekonen outside his thatched-roof hut, harnessing his plow to two oxen under a dense quilt of stars. This is the beginning of the planting season, when farmers like Mekonen make crucial decisions about how much seed to plant and fertilizer to use for the next harvest. But even though Mekonen and his ancestors have been farming this way for generations, their science is far from perfect. If the rains fail, as they did in 2008, then too much upfront investment can mean financial ruin. Conversely, if the harvest is plentiful, local prices will plummet and Mekonen will sell his crop at a loss. Even though Mekonen works some of the most fertile soil in Eastern Africa, the risks he and other farmers face in bringing their crops to market have played a central role in Ethiopia’s enduring food instability. In January of this year, Eli Cane and I set out to document the story of the new Ethiopia Commodity Exchange (ECX), the country’s first modern commodities market, and of its founder, Dr. Eleni Gabre-Madhin. We’d heard about Eleni from many sources, watched her inspiring video on TED.com and finally had had a chance to meet her in New York when she was attending the Clinton Global Initiative in September 2008. Five minutes with Eleni is more than enough time to understand the force of her charisma and the conviction that lies behind everything she does. As she described her mission to create a fair, transparent system for Ethiopia’s farmers and traders in order to improve food security in her country, we knew that we wanted to be there with our cameras to watch it all unfold. 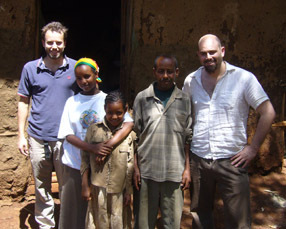 Our first two-week shoot in Ethiopia was a whirlwind of excitement and activity. The ECX had been operational for eight months and was weathering stormy seas as it entered the coffee business, Ethiopia’s largest source of foreign exchange and a vital cog in the national economy. 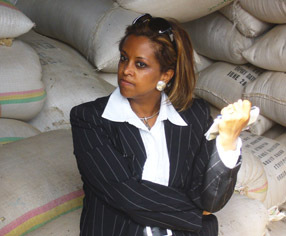 Eleni and her staff were scrambling to provide enough warehouses, grading centers and technical facilities for the industry, while the unfolding global financial crisis wasn’t doing anything to convert those skeptical of a market-based solution to Ethiopia’s agricultural problems. From our point of view, it was all fantastic — big personalities confronting issues of national importance in front of our cameras — and all we had to do was blend into the wallpaper. On this second shoot, we focused more on understanding the different constituents in the ECX system; farmers and traders in different parts of the country. After a couple of quick days catching up and planning in Addis, we hit the road in a Land Cruiser. The drive north from Addis is dramatic, especially when you plunge a thousand meters into the Nile gorge and cross the Blue Nile as she flows north to Lake Tana. As we wound our way up and down precipitous slopes, we praised the recently completed road facilitated by Ethiopia’s double-digit economic growth over the last five years. Starting your day at 3:30 a.m. means you can fit a lot in before nightfall. Anyway, Buré’s flea-ridden hotel didn’t make for a very restful sleep, so I was happy to be off the mattress and on my feet early. By the early afternoon we had filmed with Mekonen for several hours, interviewed him and accompanied him to his local farmers’ union, where he had discussed his concerns with the union officials who buy his crops. Then it was back in the car and on the road north to Bahir Dar on the banks of Lake Tana, where I am writing from now. The fresh lake breeze and sunset over the islands are a far cry from Buré’s hot, dusty intensity. But I guess it’s good to get acclimatized in stages, as we’re heading into far more inhospitable terrain in the days to come….